vanmeeuwen awarded T142: Kolab Webadmin Skin to Match New Corporate Identity a Dislike token. grote closed T556: DNS configuration description for custom domain owners in HKCCP as Resolved. grote assigned T716: Add managesieve_conn_options in config template to pokorra. grote committed rD3032342e7150: move Kolab Enterprise Upgrade Guide into proper section (authored by grote). grote added a parent task for T66: Audio and Video Communication via WebRTC: T94: Copenhagen RESTful API for OpenChange integration. grote added a parent task for T565: Finish VALARM property handling: T94: Copenhagen RESTful API for OpenChange integration. grote added a parent task for T698: Missing events on edges of the view time range (when client timezone is different than server tz): T94: Copenhagen RESTful API for OpenChange integration. grote added subtasks for T94: Copenhagen RESTful API for OpenChange integration: T565: Finish VALARM property handling, T66: Audio and Video Communication via WebRTC, T567: Finish tag/categories support, T698: Missing events on edges of the view time range (when client timezone is different than server tz). grote moved T693: Automatically add to addressbook on send from Wishlist to In Triage on the Product Owners board. grote moved T692: Assign tags to email messages by drag & drop from Wishlist to In Triage on the Product Owners board. grote moved T30: Redesign of Hosted Kolab from In Sprint to Ready for Sprint on the Product Owners board. grote moved T102: File Cloud: Support for Folder Hierarchies from In Sprint to Ready for Sprint on the Product Owners board. grote moved T32: Two-factor Authentication from In Sprint to Ready for Sprint on the Product Owners board. grote moved T491: Calendar folders appear to "disappear" from In Sprint to Ready for Sprint on the Product Owners board. grote moved T693: Automatically add to addressbook on send from Incoming to Wishlist on the Product Owners board. grote placed T693: Automatically add to addressbook on send up for grabs. grote moved T692: Assign tags to email messages by drag & drop from Incoming to Wishlist on the Product Owners board. grote renamed T692: Assign tags to email messages by drag & drop from Assign tags to email messages by drag & drop to Assign tags to email messages by drag & drop. grote moved T684: Redesign HKCCP from Incoming to Wishlist on the Product Owners board. grote removed a project from T699: Investigate and fix memory consumption/performance of PhantomJS: Product Owners. grote added a comment to T556: DNS configuration description for custom domain owners in HKCCP. I have made the first proposed change, however the explanation about SPF records can not be done easily as proposed, because the values are just read out of the configuration file in a loop without the possibility to inject further text. grote lowered the priority of T627: Pyd.io backend for Chwala from 60 to 40.
grote removed a project from T691: Hosted Kolab: Two Factor Authentication: Product Owners. grote removed a project from T690: Hosted Kolab: Bulk Processing: Product Owners. grote removed a project from T689: Hosted Kolab: Domain Registration: Product Owners. grote removed a project from T688: Hosted Kolab: Quota Information: Product Owners. grote removed a project from T687: Hosted Kolab: Additional Means of Contact: Product Owners. grote removed a project from T686: Hosted Kolab: Referrals: Product Owners. grote removed a project from T685: Hosted Kolab: Voucher Codes: Product Owners. grote added a subtask for T691: Hosted Kolab: Two Factor Authentication: T32: Two-factor Authentication. grote added a parent task for T32: Two-factor Authentication: T691: Hosted Kolab: Two Factor Authentication. grote created T691: Hosted Kolab: Two Factor Authentication. grote created T690: Hosted Kolab: Bulk Processing. grote added a parent task for T25: Hosted Kolab: Autonomous Alias Management: T684: Redesign HKCCP. grote added a subtask for T684: Redesign HKCCP: T25: Hosted Kolab: Autonomous Alias Management. grote created T689: Hosted Kolab: Domain Registration. grote added a comment to T684: Redesign HKCCP. grote created T688: Hosted Kolab: Quota Information. grote created T687: Hosted Kolab: Additional Means of Contact. grote created T686: Hosted Kolab: Referrals. grote created T685: Hosted Kolab: Voucher Codes. grote added a subtask for T684: Redesign HKCCP: T446: Allow to distinguish between admin accounts and billing accounts. grote added a parent task for T446: Allow to distinguish between admin accounts and billing accounts: T684: Redesign HKCCP. grote added a project to T684: Redesign HKCCP: Restricted Project. grote added a project to T26: Hosted Kolab: Allow use and administration of external email addresses: Restricted Project. grote removed a project from T29: Hosted Kolab: Post-calculated Storage Usage: Product Owners. grote removed a project from T28: Hosted Kolab: Freemium accounts: Product Owners. grote removed a project from T26: Hosted Kolab: Allow use and administration of external email addresses: Product Owners. grote removed a project from T156: Make HKCCP work for Mobile Devices: Product Owners. grote added a parent task for T28: Hosted Kolab: Freemium accounts: T684: Redesign HKCCP. grote added a parent task for T29: Hosted Kolab: Post-calculated Storage Usage: T684: Redesign HKCCP. grote added subtasks for T684: Redesign HKCCP: T156: Make HKCCP work for Mobile Devices, T26: Hosted Kolab: Allow use and administration of external email addresses, Unknown Object (Maniphest Task), T28: Hosted Kolab: Freemium accounts, T29: Hosted Kolab: Post-calculated Storage Usage. grote added a parent task for T26: Hosted Kolab: Allow use and administration of external email addresses: T684: Redesign HKCCP. grote added a parent task for T156: Make HKCCP work for Mobile Devices: T684: Redesign HKCCP. grote created T684: Redesign HKCCP. grote renamed T662: Custom Sent Folder for Delegation from Custom Sent Folder per Identity to Custom Sent Folder for Delegated Shared Folders. grote committed rD69e2b8db660f: fix some broken links after switch to Phabricator (authored by grote). grote added a comment to T247: WebDAV backend driver for Chwala. Does this also support different authentication credentials per user to one external WebDAV server like with SeaFile? grote moved T653: Fix handling of alarms with "zero duration" (e.g. PT0S) from Ready for Sprint to In Sprint on the Product Owners board. grote moved T466: FreeIPA integration from In Sprint to Ready for Sprint on the Product Owners board. grote moved T492: Configure Roundcube to accept self-signed certs by default (IMAP/SMTP) from In Sprint to Ready for Sprint on the Product Owners board. grote added a project to T659: Add WebDAV auth strategy for Manticore: Restricted Project. grote added a project to T624: WebDAV backend for Manticore: Restricted Project. grote added a project to T161: Use treelist.js for folder list in kolab_files: Restricted Project. grote added a project to T653: Fix handling of alarms with "zero duration" (e.g. PT0S): Restricted Project. grote moved T653: Fix handling of alarms with "zero duration" (e.g. 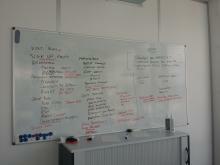 PT0S) from In Triage to Ready for Sprint on the Product Owners board. grote removed a project from T661: Figure out a way to handle different types of access control restrictions: Product Owners. grote moved T662: Custom Sent Folder for Delegation from Incoming to In Triage on the Product Owners board. grote moved T653: Fix handling of alarms with "zero duration" (e.g. PT0S) from Incoming to In Triage on the Product Owners board. grote added a project to T653: Fix handling of alarms with "zero duration" (e.g. PT0S): Product Owners. grote added a comment to T143: Show CardDAV URL also for GAL. Thanks a lot @bruederli for explaining the limitations! grote committed rD0fe189df8a14: clarify Thunderbird calendar/tasks instructions (authored by grote). grote committed rDcbb16e0e0ba5: small fixes in contributor documentation (authored by grote). grote committed rDe3edfc9bca23: update contribution documentation (authored by grote). grote created T662: Custom Sent Folder for Delegation. grote removed a project from T660: Create an abstraction layer for the Document collection, allowing different storage backends: Product Owners. grote removed a project from T659: Add WebDAV auth strategy for Manticore: Product Owners. grote moved T654: Plan subtasks and learn more about how to do WebDAV integration from Incoming to In Sprint on the Product Owners board. grote added a parent task for T580: MAPI: Contact photos as attachments: T94: Copenhagen RESTful API for OpenChange integration. grote added a subtask for T94: Copenhagen RESTful API for OpenChange integration: T580: MAPI: Contact photos as attachments. grote added a comment to T580: MAPI: Contact photos as attachments. grote added a subtask for T94: Copenhagen RESTful API for OpenChange integration: T539: Functional tests with real IMAP server. grote added a parent task for T539: Functional tests with real IMAP server: T94: Copenhagen RESTful API for OpenChange integration. grote moved T68: Support Extended MAPI natively via OpenChange from Ready for Sprint to In Sprint on the Product Owners board. grote committed rD4e381cfcf584: Add extlinks extension and provide links to Phabricator (authored by vanmeeuwen). grote committed rD9f594979dcdc: clarify long DAV addresses in client configuration (authored by grote). grote committed rDbdcf60726879: Add description for autodiscover and autoconf (authored by vanmeeuwen). grote committed rDd525af93b449: Update packages (authored by vanmeeuwen). grote committed rD5fd2b00d2233: Update packages (authored by vanmeeuwen). grote committed rDd4a484cdcf12: clarify long DAV addresses in client configuration (authored by grote). grote moved T624: WebDAV backend for Manticore from Incoming to In Sprint on the Product Owners board. grote moved T627: Pyd.io backend for Chwala from Incoming to Wishlist on the Product Owners board. grote added subtasks for T30: Redesign of Hosted Kolab: Unknown Object (Maniphest Task), Unknown Object (Maniphest Task). grote removed a parent task for T30: Redesign of Hosted Kolab: Unknown Object (Maniphest Task). grote added a parent task for T30: Redesign of Hosted Kolab: Restricted Maniphest Task.